By exploiting the properties of neutrons to probe electrons in a metal, a team of researchers led by the U.S. Department of Energy’s (DOE) Argonne National Laboratory has gained new insight into the behavior of correlated electron systems, which are materials that have useful properties such as magnetism or superconductivity. The research, to be published in Science, shows how well scientists can predict the properties and functionality of materials, allowing us to explore their potential to be used in novel ways. “Our mission from the Department of Energy is to discover and then understand novel materials that could form the basis for completely new applications,” said lead author Ray Osborn, a senior scientist in Argonne’s Neutron and X-ray Scattering Group. Osborn and his colleagues studied a strongly correlated electron system (CePd3) using neutron scattering to overcome the limitations of other techniques and reveal how the compound’s electrical properties change at high and low temperatures. Osborn expects the results to inspire similar research. “Being able to predict with confidence the behavior of electrons as temperatures change should encourage a much more ambitious coupling of experimental results and models than has been previously attempted,” Osborn said. Scientists have studied these strongly correlated electron systems for more than five decades, and one of the most important theoretical predictions is that at high temperatures the electron interactions cause random fluctuations that impede their mobility. “They become ‘bad’ metals,” Osborn said. However, at low temperatures, the electronic excitations start to resemble those of normal metals, but with much-reduced electron velocities. The existence of this crossover from incoherent random fluctuations at high temperature to coherent electronic states at low temperature had been postulated in 1985 by one of the co-authors, Jon Lawrence, a professor at the University of California, Irvine. Although there is some evidence for it in photoemission experiments, Argonne co-author Stephan Rosenkranz noted that it is very difficult to compare these measurements with realistic theoretical calculations because there are too many uncertainties in modeling the experimental intensities. The team, based mainly at Argonne and other DOE laboratories, showed that neutrons probe the electrons in a different way that overcomes the limitations of photoemission spectroscopy and other techniques. Making this work possible are advances in neutron spectroscopy at DOE’s Spallation Neutron Source (SNS) at Oak Ridge National Laboratory, a DOE Office of Science User Facility, and the United Kingdom’s ISIS Pulsed Neutron Source, which allow comprehensive measurements over a wide range of energies and momentum transfers. Both played critical roles in this study. STFC ISIS Pulsed Neutron Source. With this study, these four-dimensional measurements have now been directly compared to calculations using new computational techniques specially developed for strongly correlated electron systems. The technique, known as Dynamical Mean Field Theory, defines a way of calculating electronic properties that include strong electron-electron interactions. Osborn acknowledged the contributions of Eugene Goremychkin, a former Argonne scientist who led the data analysis, and Argonne theorist Hyowon Park, who performed the calculations. The agreement between theory and experiments was “truly remarkable,” Osborn said. Looking ahead, researchers are optimistic about closing the gap between the results of condensed matter physics experiments and theoretical models. Other Argonne authors of the paper, titled Coherent Band Excitations in CePd3: A Comparison of Neutron Scattering and ab initio Theory, are Park and John-Paul Castellan of the Materials Science Division. Also contributing to this work were researchers at the Joint Institute for Nuclear Research in Russia; the University of Illinois at Chicago; Karlsruhe Institute of Technology in Germany; Oak Ridge National Laboratory; Los Alamos National Laboratory and the University of California at Irvine. Research at Argonne and Los Alamos was funded by DOE’s Materials Sciences and Engineering Division of the Office of Basic Energy Sciences. Research at Oak Ridge’s SNS was supported by the Scientific User Facilities Division of the Office of Basic Energy Sciences. 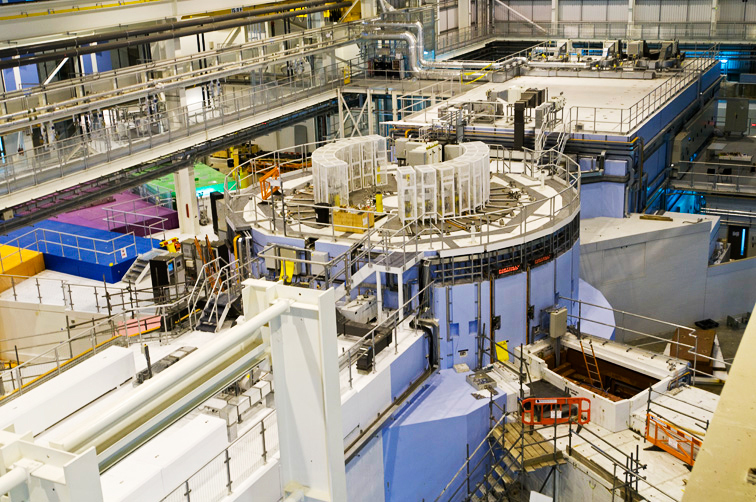 Neutron experiments were performed at the SNS and the ISIS Pulsed Neutron Source, Rutherford Appleton Laboratory in the UK. Blues, a high-performance computing cluster operated by the Laboratory Computing Resource Center at Argonne, also contributed to this research. 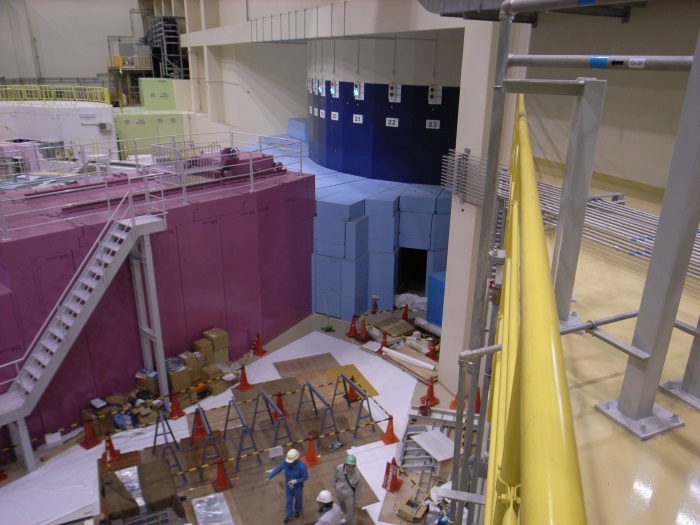 A spallation neutron source used by physicists in Japan to search for possible violations of the inverse square law of gravity. By scattering neutrons off noble-gas nuclei, the researchers found no evidence of any deviation from the tried and tested formula. However, they could slightly reduce the wiggle room for any non-conventional interactions at distances of less than 0.1 nm, and are confident they can boost the sensitivity of their experiment over the next few months. According to Newton’s law of universal gravitation, the gravitational force between two objects is proportional to each of their masses and inversely proportional to the square of the distance between them. This relationship can also be derived using general relativity, when the field involved is fairly weak and objects are travelling significantly slower than the speed of light. However, there are many speculative theories – some designed to provide a quantum description of gravity – that predict that the relationship breaks down at small distances. Physicists have done a wide range of different experiments to look for such a deviation. These include torsion balances, which measure the tiny gravitational attraction between two masses suspended on a fibre and two fixed masses. However, this approach is limited by environmental noise such as seismic vibrations and even the effects of dust particles. As a result such experiments cannot probe gravity at very short distances, with the current limit being about 0.01 mm. Neutrons, on the other hand, can get down to the nanoscale and beyond. The idea is to fire a beam of neutrons at a gas and record how the neutrons are scattered by the constituent nuclei. In the absence of any new forces modifying gravity at short scales, the neutrons and nuclei essentially only interact via the strong force (neutrons being electrically neutral). But the strong force acts over extremely short distances – roughly the size of the nucleus, about 10–14 m – while the neutrons have a de Broglie wavelength of around 1 nm. The neutrons therefore perceive the nuclei as point sources and as such are scattered equally in all directions. Any new force, however, would likely extend beyond the nucleus. If its range were comparable to the neutrons’ wavelength then those neutrons would be scattered more frequently in a forward direction than at other angles. Evidence of such a force, should it exist, can therefore be sought by firing in large numbers of neutrons and measuring the distribution of their scattering angles. In 2008, Valery Nesvizhevsky of the Institut Laue-Langevin in France and colleagues looked for evidence of such forward scattering in data from previous neutron experiments. They ended up empty handed but could place new upper limits on the strength of any new forces, improving on the existing constraints for scales between 1 pm and 5 nm by several orders of magnitude. Those limits were then pushed back by about another order of magnitude two years ago, when Sachio Komamiya at the University of Tokyo and team scattered neutrons off atomic xenon at the HANARO research reactor at the Korean Atomic Energy Research Institute in South Korea. In the new research, Tamaki Yoshioka of Kyushu University in Japan and colleagues use neutrons from a spallation source at the Japan Proton Accelerator Research Complex (J-PARC) in Tokai, which they fire at samples of xenon and helium. Because the J-PARC neutrons come in pulses, the researchers can easily measure their time of flight, and, from that, work out their velocity and hence their wavelength. Armed with this information, the team can establish whether any forward scattering is due to a new force or simply caused by neutrons bouncing off larger objects in the gas, such as trace amounts of atmospheric gases. At any given wavelength, both types of scattering would be skewed in the forward direction and so would be indistinguishable from one another. But across a range of wavelengths different patterns would emerge. For atmospheric gases, the scattering angle would simply be proportional to the neutrons’ wavelength. In the case of a new force, on the other hand, the relationship would be more complex because the effective size of the nucleus would itself vary with neutron wavelength. Reactors can also be used to generate pulses, by “chopping” a neutron beam. But that process severely limits the beam’s intensity. Taking advantage of the superior statistics at J-PARC, Yoshioka and colleagues were able to reduce the upper limit on any new forces below 0.1 nm by about an order of magnitude over the HANARO results – showing that their inherent strength can at most be 10^24 times that of gravity’s (gravity being an exceptionally weak force). That is still nowhere near the sensitivity of torsion balance searches at bigger scales – which can get down to the strength of gravity itself. As Nesvizhevsky points out, torsion balances use macroscopic masses with “Avogadro numbers” (1023) of atoms, whereas neutron scattering experiments involve at most a few tens of millions of neutrons. Nevertheless, he believes that the new line of research is well worth pursuing, pointing out that many theories positing additional gravity-like forces “predict forces in this range of observations”. Such experiments, he argues, represent “an extremely cost-effective way of looking for a new fundamental force” when compared to searches carried out in high-energy physics. Spurred on by the prospect of discovery, Yoshioka and colleagues are currently taking more data. The lead author of a preprint on arXiv describing the latest research, Christopher Haddock of Nagoya University, says that they hope to have new results by the summer. A series of improvements to the experiment, including less scattering from the beam stop, he says, could boost sensitivity to new forces in the sub-nanometre range by up to a further order of magnitude and should also improve existing limits at distances of up to 10 nm. Producing biofuels like ethanol from plant materials requires various enzymes to break down the cellulosic fibers. Scientists using neutron scattering have identified the specifics of an enzyme-catalyzed reaction that could significantly reduce the total amount of enzymes used, improving production processes and lowering costs. Researchers from the Department of Energy’s Oak Ridge National Laboratory and North Carolina State University used a combination of X-ray and neutron crystallography to determine the detailed atomic structure of a specialized fungal enzyme. A deeper understanding of the enzyme reactivity could also lead to improved computational models that will further guide industrial applications for cleaner forms of energy. Their results are published in the journal Angewandte Chemie International Edition. Part of a larger family known as lytic polysaccharide monooxygenases, or LPMOs, these oxygen-dependent enzymes act in tandem with hydrolytic enzymes—which chemically break down large complex molecules with water—by oxidizing and breaking the bonds that hold cellulose chains together. The combined enzymes can digest biomass more quickly than currently used enzymes and speed up the biofuel production process. In an LPMO enzyme, oxygen and cellulose arrange themselves through a sequence of steps before the biomass deconstruction reaction occurs. Sort of like “on your mark, get set, go,” says O’Dell. In the active state, oxygen binds to a copper ion that initiates the reaction. Aided by X-ray and neutron diffraction, O’Dell and Meilleur identified a previously unseen oxygen molecule being stabilized by an amino acid, histidine 157. Hydrogen is a key element of amino acids like histidine 157. Because neutrons are particularly sensitive to hydrogen atoms, the team was able to determine that histidine 157 plays a significant role in transporting oxygen molecules to the copper ion in the active site, revealing a vital detail about the first step of the LPMO catalytic reaction. Their results were subsequently confirmed via quantum chemical calculations performed by coauthor Pratul Agarwal from ORNL’s Computing and Computational Sciences Directorate. Research material preparation was supported by the ORNL Center for Structural Molecular Biology. 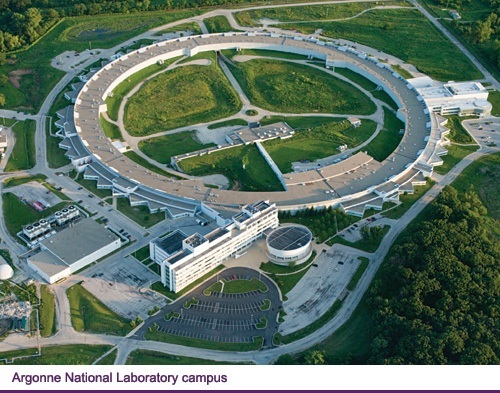 X-ray data were collected at the Argonne National Laboratory Advanced Photon Source through access provided by the Southeast Regional Collaborative Access Team. O’Dell says their results refine the current understanding of LPMOs for science and industry researchers. HFIR is a DOE Office of Science User Facility. UT-Battelle manages ORNL for the Office of Science. The Office of Science is the single largest supporter of basic research in the physical sciences in the United States and is working to address some of the most pressing challenges of our time. For more information, please visit http://science.energy.gov/. In a Fluid Interface Reactions, Structures and Transport Center project to probe a battery’s atomic activity during its first charging cycle, Robert Sacci and colleagues used the Spallation Neutron Source’s vibrational spectrometer to gain chemical information. Image credit: Oak Ridge National Laboratory, U.S. Dept. of Energy; photographer Genevieve Martin. Rechargeable batteries power everything from electric vehicles to wearable gadgets, but obstacles limit the creation of sleeker, longer-lasting and more efficient power sources. Batteries produce electricity when charged atoms, known as ions, move in a circuit from a positive end (anode) to a negative end (cathode) through a facilitating mix of molecules called an electrolyte. Scientists at the Department of Energy’s Oak Ridge National Laboratory are improving the lifetimes of rechargeable batteries that run on lithium, a small atom that can pack tightly into graphite anode materials. The valuable ions are depleted as a battery charges, and they are also lost to the formation of a thin coating on a battery’s anode during initial charging. ORNL researchers used two of the most powerful neutron science facilities in the world to try to understand the dynamics behind this phenomenon. In a paper published in the Journal of Physical Chemistry C, the ORNL researchers focused on the spontaneous growth of the thin coating, called the solid-electrolyte interphase (SEI). This nanoscale coating protects and stabilizes the new battery, but it comes at a cost. The electrolyte, a mixture of molecules composed of hydrogen, carbon, lithium and oxygen, is forced to break down to form this film. Sacci and colleagues used beams of subatomic particles called neutrons to delve into a battery’s atomic reactivity during its first charging cycle. Neutrons were necessary because they can easily enter three-dimensional structures and are sensitive to changes in hydrogen concentration, a major component of electrolytes. ORNL researchers targeted anode samples with neutrons from the Spallation Neutron Source (SNS), the world’s most intense pulsed beam, and the High Flux Isotope Reactor (HFIR), the highest continuous-beam research reactor in the United States. They tracked the scattered paths of the neutrons after the beams penetrated the material, creating a constantly updating map of the sample’s molecular dynamics. Neutron scattering is key to understanding battery activity on the atomic scale. While the diffracted beams of neutrons would appear to be a jumbled mess to most—like lights dancing off a disco ball in all directions—skilled scientists use these scattering signals to calculate chemical and structural changes while the SEI layer develops. Is battery film friend or foe? Once the SEI layer forms, it buffers degradation of the electrolyte and prevents a dangerous buildup of metal deposits on the lithiated-graphite anode, increasing a battery’s life cycle. Sacci and his team wondered if a pre-made film could protect the anode while minimizing the consumption of lithium ions. The ORNL scientists incorporated lithium atoms into vacancies within graphite through grinding at high force. The result was a powdery, charged anode material that they then dipped into an electrolyte solution. A thin film formed around each lithiated-graphite particle, encapsulating it. At this point, the scientists were ready to subject samples to neutron scattering tests to gain a fresh perspective into how an SEI layer generates during initial charging of a lithium-ion battery. Researchers used SNS’s vibrational spectrometer, VISION, to gain chemical information about the SEI layer. HFIR allowed the ORNL scientists to use small-angle neutron scattering (SANS) techniques to map the thin film’s structure and chart new information about its formation. “With VISION, we can measure the vibrations of atoms, which tell us how they are bound within molecules, and with SANS, a scattering instrument at HFIR, you’re looking more or less at how big the particles are and how they are arranged,” Sacci said. After exploring the lithiated-graphite anode material, Sacci and his fellow energy researchers now understand the chemical process by which the thin protective layer generates on the anode. “We were able to definitely say, yes a polymer formed, the particles appeared bigger—which means a layer grew on them—and they were more interconnected,” said Sacci. This research was supported as part of the Fluid Interface Reactions, Structures and Transport (FIRST) Center, an Energy Frontier Research Center funded by the U.S. Department of Energy Office of Science. Work was performed at the Spallation Neutron Source and the High Flux Isotope Reactor, DOE Office of Science User Facilities at ORNL.